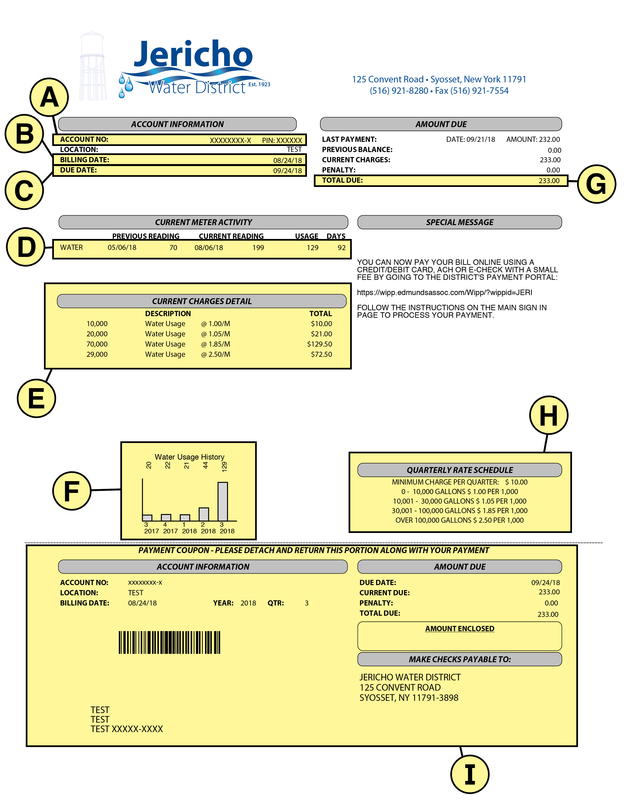 To help you understand your water bill, please refer to the graphic below with the corresponding lettered descriptions. You may call the District Office Monday through Friday between 8:00am and 4:00pm at (516) 921-8280 for any further questions about your bill. We are happy to help you! A: ACCOUNT NUMBER is assigned to your account by the Water District. PIN is used for paying your bill online. B: BILLING DATE is the date that the bill was generated. C: DUE DATE is the date which payment is required to be received by the District. Payment must be made within thirty (30) days of the bill date. Should the due date occur on a weekend or holiday, the next business day will take effect as the due date. A ten (10) percent penalty of the amount due and unpaid for thirty (30) days or longer will be assessed. D: CURRENT METER ACTIVITY indicates the previous date and water meter reading and the current date and water meter reading. It shows the total usage in thousands of gallons and the number of days between the previous reading and the current reading. E: CURRENT CHARGES DETAIL shows your water consumption and the water rate schedule of charges, detailing how we arrived at your specific charges. F: WATER USAGE HISTORY shows a graph of your water usage for the five (5) previous quarters. G: TOTAL DUE indicates the amount due on your due date. It takes into account any prior balances and/or penalties assessed on your account. 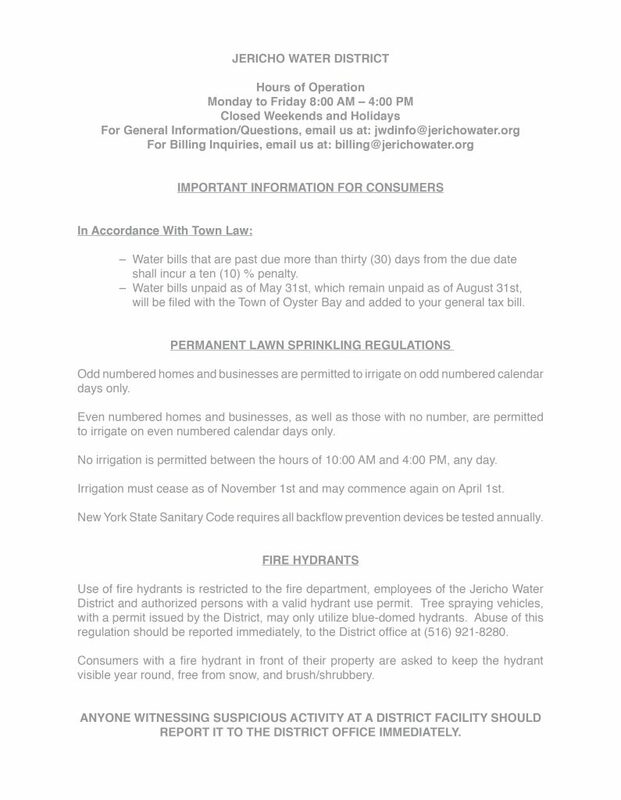 H: QUARTERLY RATE SCHEDULE details the billing rate structure for Jericho Water District. I: PAYMENT COUPON can be detached and returned with your payment, or you can pay your bill online at https://wipp.edmundsassoc.com/Wipp/?wippid=JERI.